I’ve had a Christmas rant building inside me for months now. It began when I saw Christmas trees in Costco in August and picked up strength with the unpleasant arrival of Christmas carols in retail stores on November 1st. The sudden proliferation of tiny kiosks peddling kitsch in the malls bothered me, as did the self-imposed pressure to find the perfect gift. I’ve had Norm McDonald’s line from Weekend Update running through my head for weeks – “Happy birthday, Jesus. Hope you like crap”. Yesterday, however, a miracle happened. It snowed and snowed and snowed, and the world was forced to slow down. I have this romantic notion that yesterday’s storm changed us from stressed-out consumers to blissed-out children, at least for one day. 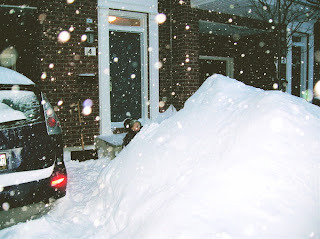 I marveled at the height of the snowbank in front of our house and loved seeing people ski down our little street. 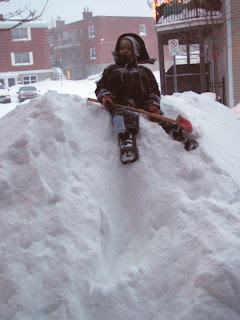 I pulled Aidan around the neighbourhood on a sled over roads that were otherwise unusable, and was thankful for the chance to share the experience with him. So far, December has been a nice throwback to the winters of my youth, or at least the way I pictured them through young eyes. Sure, driving hasn’t been fun at times, and my back seized up a few times today after I strained it while shoveling the driveway, but I feel so, well, Canadian. Recent winters have been characterized by a remarkable absence of snow and drama, so it’s nice to be reminded of the unforgiving environment that our founding fathers (and mothers) braved when they chose to settle here. There’s the feeling that we’re witnessing something special, a once-every-thirty-years kind of winter that people will talk about for years to come. Come on, Mother Nature, show us what ya got. I’ll leave you with a couple of pictures of Aidan. In this one, he’s almost hidden by our little snow mountain. Here’s my little sherpa perched on top of our personal Matterhorn.